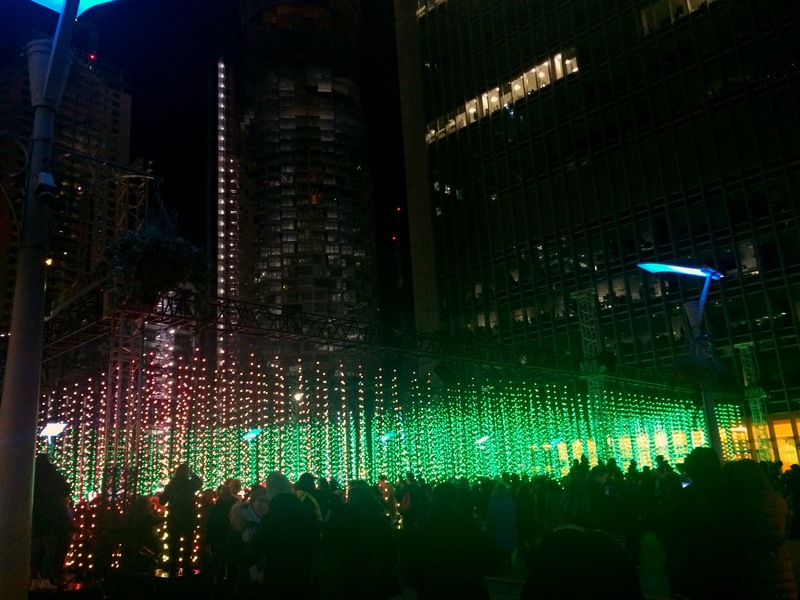 The Winter Lights festival this January was an immersive treat for the eyes, body and soul. Venturing into Canary Wharf on Sunday into London’s city-banking metropolis, there couldn’t have been a place more apt for such cyber escapades. 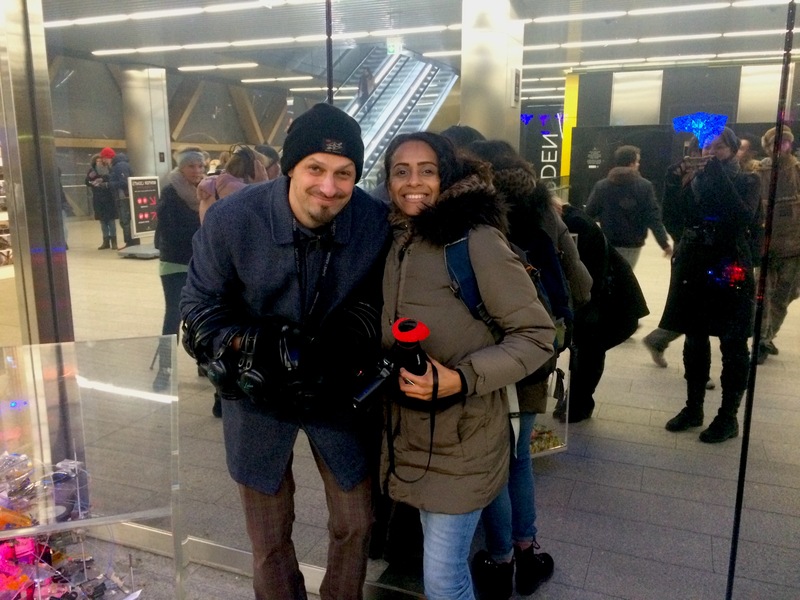 With twenty-one installations placed all over Canary Wharf, it was like traipsing through a futuristic complex where you had to either follow the light or listen out for the abstract soundscapes of technology echoing in the distance. 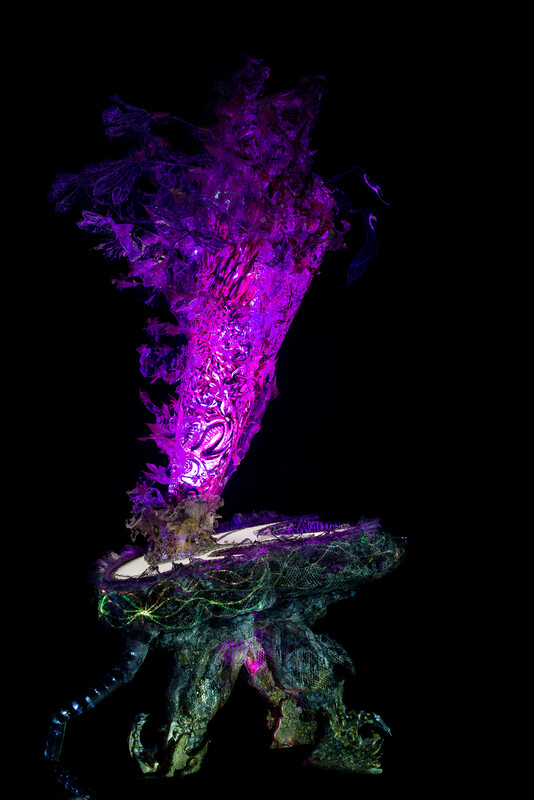 Although I didn’t get to see all twenty-one of these installations, my friend/neuroscientist artist Iris and I had planned the sites we really wanted to see as a priority. SUBMERGENCE by Squidsoup welcomed us as it illuminated in the middle of Montgomery Square with tiny LED bulbs hanging from cable/wire/string. The area itself appeared rectangular in form, but was decorated by free-moving bulbs. Working on a timed loop, the installation would begin with a soundscape that felt much like you were in the ocean which then transformed into a cosmos with planets, stars and other constellations dissolving in and out of existence. 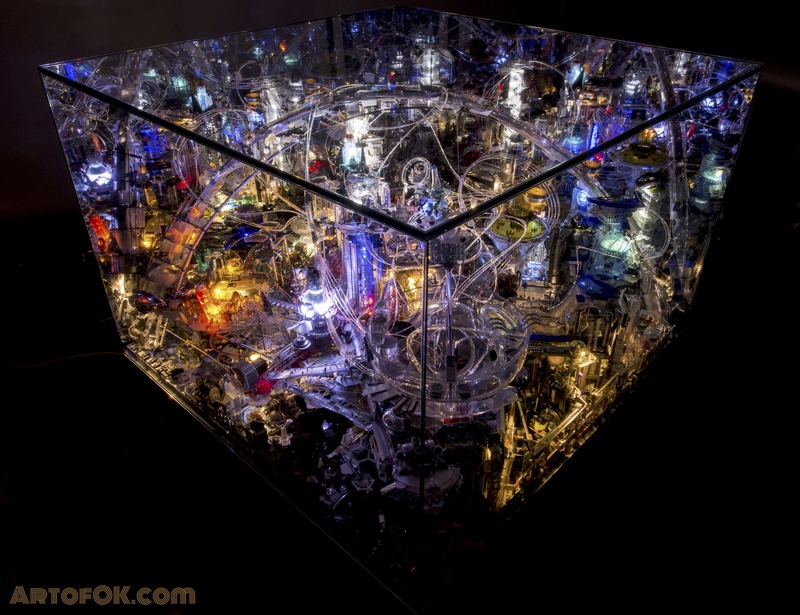 Because the lights were malleable, people would move them or walk in and out of the space, so this also created a trippy illusion and a prism of both planetary and deep aquatic reality. BIT.FALL by Julius Popp is a subliminal water-installation where through a jet-stream, water would create words as it sprayed down. It was enough to catch your attention with statements formed by water. HEOFON LIGHT MAZE by Ben Busche provided great fun and was almost like being in a Gaspar Noé movie, roaming down a passage inside one of his Love Hotels! 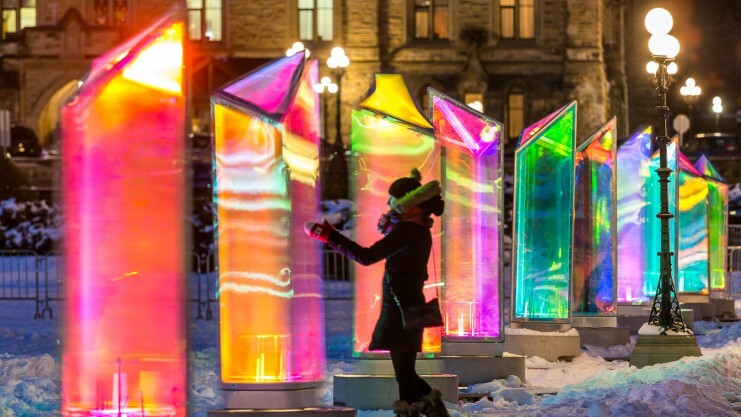 The maze is made from acrylic glass and geometrically arranged so that the lights change to create rainbow colours and other vibrant light reflections. The position of the glass have an infinity-mirror feel to it which is probably why I felt like I couldn’t leave. I actually went around the maze four times because it was so much fun. CABOT SQUARE FOUNTAIN gave way to a fantastical light and water show accompanied by Disney music! I lay on my back and watched as the water looked like it was going to cascade upon me in several small waves. There was also something really liberating about seeing the squirting of water from that angle, spurting and expelling up into the air, seemingly like the drops of water were glittering in the atmosphere. COLOUR MOVES by Rombout Frieling Lab exhibited at the Adams Plaza Bridge. Inside either end of the bridge was decorated by digital graphic patterns with coloured LED lights phasing in and out at various points upon the pattern. ‘Our perception is limited to our senses and what we see is subject to the conditions. The word has countless perspectives and colour is an effective metaphor. We ended with PRISMATICA by Raw Design at the Jubilee Plaza. Fifty reflective pivoting prisms were scattered amongst each other. This meant that visitors could push and pull them and they’d spin around, creating surreal-light displays. Iris and I pulled a few at the same time and ran around them. It was fun to see how your eyes would adjust to the various fusions of light-works that were being generated by the movement. RECYCLISM by Oskar Krajewski/Art of OK provided the meat and flesh of everything I strive to achieve for in film. And with my work in progress film ‘From Me To You,‘ Oskar’s work from research, development, conception, modelling and now exhibiting, is a process I deeply resonate with. What more, he’s done all of this himself. 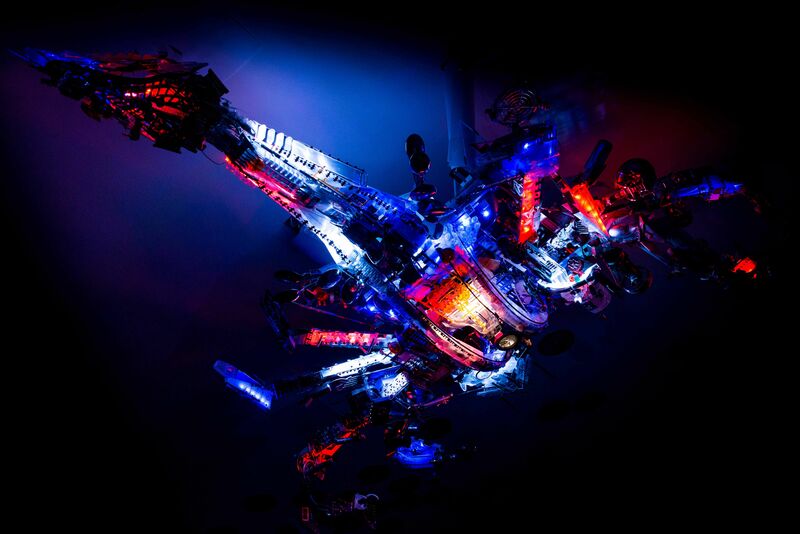 His exhibition RECYCLISM is comprised of intricately formed sculptures, robotics and dystopian lightbox metropolis’ made from recyclables. At the exhibition, headphones were handed out and you could experience Oskar’s terrain and mind with the soundscape. 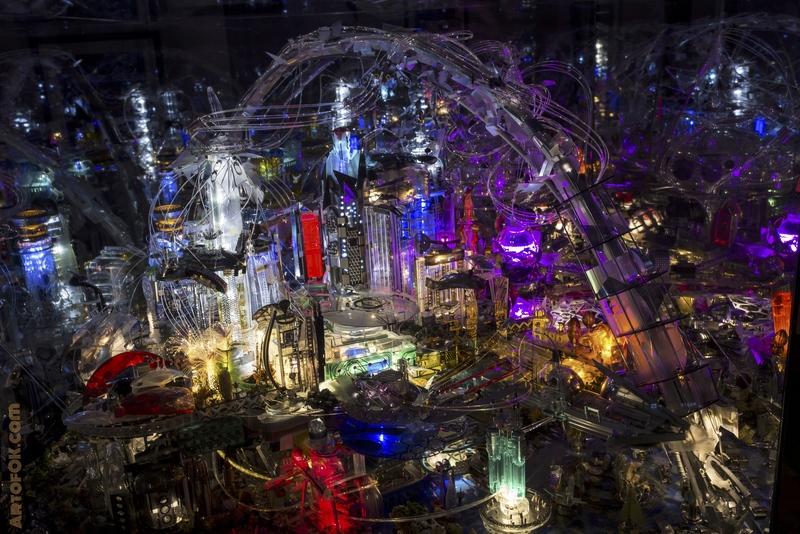 ‘Recycled Future,’ is made from over twenty-five thousand pieces of recyclables and took three years to complete. You can see Oskar’s video below (all videos of his work can be seen at www.artofok.com) and read more about the piece here. The evolution of AMALGAMEA is made from reclaimed wood, scrap perspex, found terracotta and metal mesh, hand drawn paper, oil paint LED and loads more. 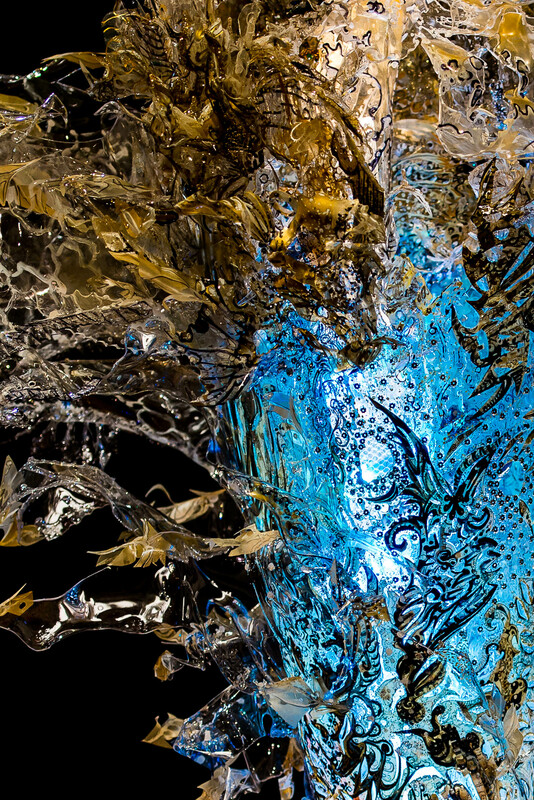 The textures are incredibly alien-esque in formation with marine-floral inspiration creating the basis of this hybrid piece. I gasped instinctively hugging him close like a crazed fan. Thereafter, Iris and I introduced ourselves to artist Oskar Krajewski and spoke about his work briefly. He gave us his business cards and told us we could choose since each one had a different design. I’ve kept the one he handed me…perhaps I will keep it forever and not wash it…oh wait it doesn’t work like that with business cards because you can’t wash them anyhow! Nonetheless I look forward to seeing more of Oskar’s work. And, being a producer/writer/director/performer immersed within the sci-fi, horror and technological genre, there’s no better time than to find likeminded people/personalities to explore with or at least be inspired by. Thank you, Oskar, for openly sharing your work. You can follow my film Instagram on from_me_to_you_film and my Wickergirl Instagram Wickergirl666. Thanks for reading and I look forward to sharing more with you soon.